Five centuries of understated tea bowls get to the heart of the wabi-sabi aesthetic. The Cosmos in a Tea Bowl from the Raku family presents a rare opportunity for insight into an art that began over half a millennium ago. 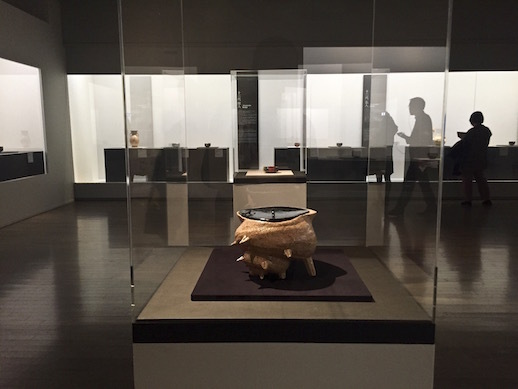 Surveying the family’s beginnings with tea master Sen no Rikyu and the creation of their wabi-sabi aesthetic through ongoing innovation and expansion, the National Museum of Modern Art, Tokyo offers a thorough introduction into the Raku universe. MOMAT’s selection of exhibitions as of late features excellent work that will leave most walking out with exactly what a museum is suppose to give: a cultural education. Raku ceramics began in the 16th century with Sen no Rikyu requesting forefather Chojiro (then a tile maker) create tea bowls in the wabi-sabi style. Wabi-sabi can be described as a world view based on the acceptance of imperfection and transience. In regards to tea bowls, they would then be shaped by hand (not thrown on a wheel) with colors and textures that emphasize un-refinement and simplicity. These bowls were presented to Japan’s great unifier, Hideyoshi Toyotomi, who stamped them with a seal featuring the Chinese character “raku,” thus setting up a family name that has since become closely associated with the wabi-sabi aesthetic and is featured in other aspects of Japanese culture, especially literature. 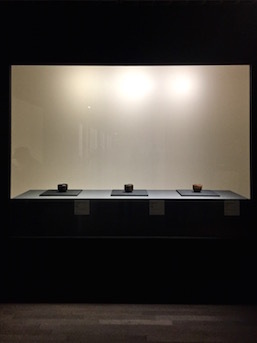 Given the restrained look of wabi-sabi, this exhibit could be underwhelming to the untrained eye: It is essentially a show of about 150 teacups and other ceramic works. For historical context and further insight, take advantage of the museum’s headphone audio guide (available in English and Japanese). Usually at these exhibits the book corresponding with the show is quite informative, however the catalog for this one features a mere four paragraphs of English. Of course, just seeing the exhibition for oneself with some understanding of wabi-sabi suffices. Truly appreciating these pieces, though, opens up a new level of cultural sensitivity that even many Japanese in mainstream society no longer possess. 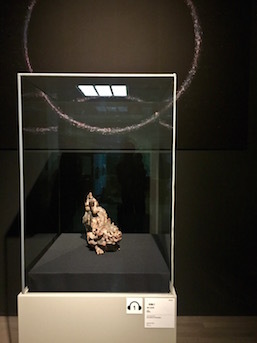 “Cosmos in a Tea Bowl” is a unique opportunity for the fan of Japanese art, because instead of showcasing perfect aesthetic objects anyone can on some level at least objectively appreciate, these works demand subjectivity from the onlooker. With an understanding of this approach, the literature of Yasunari Kawabata, for instance, in his use of the mono no aware becomes clearer, as do the films of Yasujiro Ozu. The progression of the Raku style through the centuries with each generation is fascinating. Although radical variations are relatively few as most changes were due in part to the social conditions of the times, distinctive modernizations of the Raku style can be seen in current family head Kichizaemon XV’s work. His pieces appear slightly rougher in construction, yet are strangely more elegant because of their modern lines and the forms in which he paints the glaze. These works are complimented by tea caddies and flower vases, but also do not miss the avant-garde innovations of minimalistic sculptures taking the vague forms of the animals they are named after. These objects feel like a true progression while remaining within the aesthetics of Raku. They embody the daunting commitment of Raku Kichizaemon XV to his family’s past, never straying too far from its values. Take your time with this exhibition and again, use the audio guide. Marcel Breuer’s Furniture: Improvement for Good on the second floor exhibits the Bauhaus designer’s work, providing a fun contrast in its Western approach to minimalism versus the wabi-sabi style of the Raku tea bowls. Both can be appreciated as functional art, allowing us to re-examine the objects we may take for granted in our daily lives as something more expressive.